Jethro has been planning this for a long time. He has even arranged for the old crone to take care of Phoenix for the night. Candles are lit everywhere and rose petals scattered all over the red carpet and the table. Servants wait discretely in the background to cater to their every whim and to serve the planned meal. The room is full of potted crocuses, and draped over with soft fabrics of red and pink. He has also hired a piper and a singer to play soft music as they dine. He is dressed in his finest plaid and looks as neat as it is possible for him to look. All that is required is for the love of his life to arrive. Re: [RP] Be my Valentine? Her heart raced as she followed the directions upon the parchment to the letter. As she arrived, she felt out of breath. As she entered the room, she was taken aback. Everything was perfectly placed.. the setting was sweet and the glow of the candles warm. When she notices the flowers chosen for the setting, she blushes. White and purple yellow centered crocuses are placed around the room, adding an unexpected touch to the place. It makes her feel overjoyed that he remembers her favorite flower. Again, he has managed to steal her breath away. And when her eyes fall upon him, she smiles. In her hand still are the rose the parchment and the red satchel. She suddenly feels like she is out of place but she moves forward to greet her handsome husband with a hug and a kiss. Smiling up at him she thinks about what a scoundrel he is. She had had no idea he was planning such an evening. Rather than sayso, she speaks lightly. Hello, you. His eyes light up as he sees her, the glow from the candlelight giving her an almost angelic look. Once again his heart leaps in his chest and he counts himself to be the luckiest person in the world to even be allowed near her, let alone to be loved by her. "You look lovely as always my dearest, welcome to your night." He pulls out a chair for her to sit down and nods slightly towards the musicians so that they can begin to play. He so desperately wants everything to be perfect tonight, because he wants to show her how deeply he loves her. He knows that he often gets carried away with day-to-day living and that he has sometimes put town and County before her, but never once has she been out of his mind. Everything he does and all he works for, is to secure a good future for his family. "May I offer you some wine my love?" He feels like a school boy, all fingers and thumbs, shy as he has never been before. Instead of talking, he just looks at her and smiles, happy to take the time to freeze this moment in his head forever. As he offers her a seat, she takes off her cloak and it is immediately taken care of by someone she assumes is staff. She smiles at him and it is like falling in love all over again. His attire, she can tell he put so much effort into looking his best.. and her smile widens. He doesn't know that even if he were dressed in rags, she would love him just the same. Crossing to him, she is about to take as seat, but before so she brushes the back of her hand across his jaw and looks deeply into his eyes. Thoughts of a kiss flash lightning fast across her mind, but she refrains moving to take her seat. She is still slightly in shock with everything. At his words, she feels a blush upon her cheeks and feels like her heart could burst at any moment. At the offer of wine she nods.. Yes, please... Looking up at him from her seat as he pours the wine she almost shakes her head. How had he set all of this up without her knowing? She smiles a crooked grin at him. For once in her life, she would like to know what she has done to be so lucky to have him. He smiles as he looks at the woman he loves to call sweetheart. 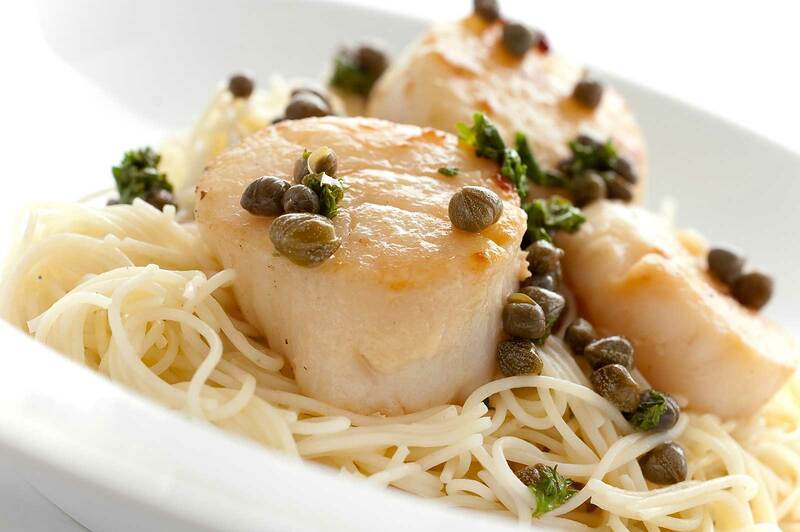 Then, on cue, the first course of their meal is brought out to them, scallops with capers on angel hair pasta. "My love, you have brought richness and joy to my life, I hope tonight to be able to show you how much you mean to me." He raises his glass to her and smiles, he has a very good mellow feeling inside him. She always makes him feel calm, he is only now beginning to realise how much. She watches as he pours the wind, and takes it all in. The man that she has come to depend upon and cherish more than she had ever known could be possible, was before her. She had always found him handsome, but tonight there was something else about him. They had grow so much since meeting what seemed like ages ago. Her life and her world seemed so meaningless back then.. Just another lost wonderer upon the earth... But now, life meant so much more. She had a family.. she was a wife, a mother.. and most importantly her life had found a purpose. She wanted nothing more than to bring him, and their son, the joys of life that she could only give. By doing anything and everything a woman does, a mother does... just to make them know how much they mean to her. Yet, here -he- was.. creating something she had never expected.. Making -her- feel special, when she knew deep down she wasn't anything more special than he was to her. She smiled as their meal arrived and then at him when he began to talk. The music perfect for the atmosphere. His toast brought a fresh blush upon her cheeks. I.. I wasn't expecting all of this... I can't believe you... She almost chuckled but the lump in her throat hindering her voice, making it all come out in almost a whisper. She was pleased and so surprised. But she sat so still, her hands in her lap, afraid that if this was all a dream, she would soon wake up, and it not be real. She swallowed the lump back. Then picked up her glass and tipped it his way. Finding her voice she smiled, knowing her cheeks were a-glow, but she didn't care anymore. This wasn't a dream. He was her husband.. and when she had fallen in love with him, she knew that it was completely and deeply. Jethro, you have made me one of the happiest women to ever live. You took this walk with me and there has been a smile upon my face ever since. I never knew what sharing a life with someone could truly be like, until I met you. I had little girls dreams about love, but you made them true...She felt a tear at the corner of her eye, and she dashed it away, afraid to look like a silly blubbering woman, then squeeked out lightly. Thank you... for everything.. Before taking a sip of her wine. He reaches out to take her hand in his and lightly squeezes it. He thinks back to his past, a past as wild and unruly as his hair always is. He also remembers the day he consciously took a step back, turned away from Ceana and let his brother court her. That had been the most painful day of his life. Back then, he had been grateful to join an army and leave, even death would have been a blessing, far better than the torment in his heart for feeling so jealous of his own brother. He had fled only to land himself into trouble, not only with a harlot, but in battle. Even as he had dragged his injured and dejected self home, he had been robbed and left for dead in a ditch. To make matter worse, he got back to Galloway to find out his brother was dead. It was when he went to find out what happened, that he saw her again. To his shame, his feelings got all mixed up and he was not able to hide how he felt about her. It was so bad she ran away from him. He smiles now as he looks into her eyes, thinking of the days he had spent in the army barracks, writing notes that never got sent and buying little gifts for her in the market. He can't remember when it was that he realised that she had feeling for him, but he is sure that he has always loved her. Now sitting here, holding her hand, he knows that he always will love her with every fibre of his being. As their starters are taken away, the minstrels start up again. "I hope you like this. She smiled as the singers began, and even chuckled a little. The plate that was taken away had been delectable. She had never experienced food that was so perfectly cooked that it seemed like a disservice to even eat it. Inhaling deeply, she waited for the candle to be re-lit in order to see what she was about to eat. She chuckled in the darkness, and her mouth watered. She could tell from the aromas that her plate held fish of some sort and it smelled delicious. She heard scrambling in the darkness, she could only assume someone was trying to find something to lite the candles with. The scent of the lemon from the fish is enticing, what a pity that "Speedy Gonzales" put the candles out. Jethro chuckles as the maître d’ races in to their rescue and re-lights the candles. "ahh, that is better, now we see what we are eating!" Jethro chuckles and leans forward, winking saucily at her. "and I can see your lovely face once again." Then he leans back and pulls a rolled up parchment out of his plaid. He passes it over but doesn't let go of it yet. As he always is when he has to ask something that is close to his heart, he is all tongue-tied. "My love, this is a licence." He takes a deep breath and tries to be more coherent. "I know that we are already wed, but this is a licence from the County. My love, will you join with me in renewing our vows?" He lets go of the parchment so that she can read it and he holds his breath in anticipation. She giggles as the poor man rushes in to light the candles. At Jeths words she blushes, then grins back at him as it reminded her of a childhood story her grandfather had told her, when she come to be in his care at around the age of five. Oh yes! This looks lovely! she stated, looking down at her plate. Then back up at him across the table. She watches him curiously as he pulls out the parchment. As she begins to take it, she is halted by the words that follow. At first she looks at him, not understanding. A license? she asks a bit bewildered. But then he goes on to explain..
As he lets go of the parchment, she opens it and reads. A renewal? Her smile blooms on her face. He seemed to be looking at her with anticipation.. She thought about being a brat and making him wait, as it was she was taking too long to answer. Rolling the parchment up, her smile turns into a grin. Well.. Hmm.. I think I need to think on it... she let out a giggle unable to hold back, then brightened. Of course I would love to do this! A chance to say how much I love you? I wouldn't miss it! Stretching her hand across the table, she takes up his hand and squeezes it, letting him know that she was devilishly playing around with him. He sees the teasing light in her eyes as he waits for her to decide. When he had first asked her to be his wife, he had not known her as he does now. Then, when she teased, he had sweated, doubting himself so very much. Now, he is sure of her love for him, just as he is sure of his love for her, so, when she dithers, he merely looks at her with one raised eyebrow, wondering how long she will be able keep him waiting. As it turns out, she is as impatient as him and doesn't keep him waiting too long. With her giggle singing in his ears, he beams at her. He is not able to stay in his seat a moment longer so he moves around to her side of the table and hugs her tight. "I love you so much my darling, and no matter what happens in the future, you will always be the queen of my heart." After giving her a warm and loving kiss, he sits back down and watches as their plates are cleared away and the dessert is brought in. It is heart-shaped pannacotta with raspberries. At his subtle gesture, the singers sing his next choice of music. Come and save me tonight "
She watches as he crosses over to her. The same thought that had occurred to her in doing, but she halted. If he only knew how he made her feel. Just being around him makes her feel like she is going 100 different ways and no a clue as to where to start! But she wouldn't have it any other way. She didn't want him to think her too eager.. but she was. He filled her senses.. every last one of them... He was in her heart and her thoughts every waking moment. She had heard that feelings like this fade, but there was no end in sight for her. She didn't want there to be. Ever. It amazed her how often their thoughts and actions reflected one-another. Sometimes it scared her at how much they seemed to be in-sync. They had grown to know each-other in such a complete manner it boggled her mind at times. Some had even stated that they were not like any other couple they had ever met... and she had to agree. Others had said she flaunted her family.. She didn't feel she did. To be proud of your family and not be ashamed of love was not something she would classify in a negative manner. She loved her husband deeply.. and she didn't care who knew it. His kiss was sweet and tender. His voice was the gently man she has come to love and confide in. She smiled at him when he finished talking. And simply stated what was in her heart. I love you Jeth. She said quietly before he returned to his seat. As the dishes are cleared, she is so amazed at the cook that had prepared the meal thus far. The plates had been fantastic, perfect balances of flavours. When the desert is set before her, it looks so scrumptious. As the music began, she looked across as he began singing to her and she felt tears in her eyes. So far everything had been absolutely perfect but this... this melted her heart. As he sang, she allowed the tears to fall, but a smile remained upon her lips. There were no words to describe how much she loved him.. There wouldn't ever be words that could describe it. "my love, would you do me the honour of sharing this dance with me?"